~from what position we are viewing it (looking straight down we see more of the water color and looking out at an angle we see more of the reflection). Let’s imagine standing on the bank of a small pond. As we look down into the water on a fairly perpendicular line, we will see the bottom of the pond (sand or mud). When we look a bit more closely we may also see some reflection of the sky. As we look out at the pond at more of an angle, the view of the bottom disappears and the reflection from the sky or trees becomes predominant. What this means usually is that the color in the near shallow water will be a bit warmer and darker (partaking of the brown bottom) and become lighter (reflecting the sky) as you look out toward the center of the pond. Now look at the trees reflecting into the pond on the far side. If the day is sunny, you will see more color in both the sky reflection and the trees. On a cloudy day or when the light is low, these colors will be grayer. Generally speaking, in reflections of darker objects, you can see more of the color of the water. Here is a wonderful example of some of these concepts at work in this painting by contemporary American landscape painter Joseph McGurl. You can see the concept described above at work in this painting. The near water is yellowish/brownish green- partaking of the brown bottom as well as the water color. Also notice the shadow cast by the fish on the bottom. As you look out into the pond the reflection of the sky is seen-darker in the middle where the zenith of the sky is reflected and lighter toward the far bank where the light from a lower part of the sky is being reflected. A few horizontal light lines (reflecting the sky color) here and there complete the illusion. 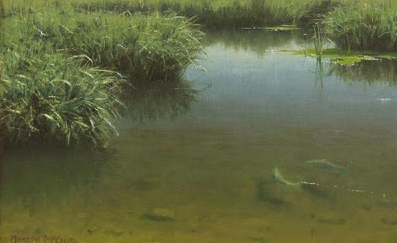 Here is another example by Clyde Aspevig, another contemporary American landscape painter. Here parts of the water are moving so the reflections are less apparent, but you can still see their color. In the near pool where the water is more still, the color of the water and the bottom of the river overtakes the reflection from the sky and the transparency of the water allows us to see rocks on the bottom. P.S. For centuries the depiction of water has challenged artists. Its unique properties- transparent, reflective, moving, still- create wonderful visual opportunities. 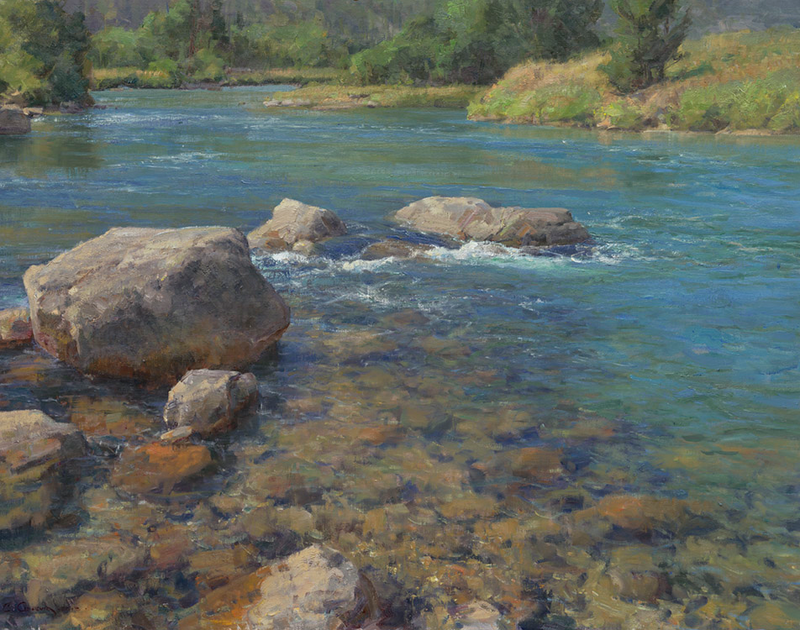 In our annual Painting Water online class we learn how reflections are created and how to depict them, how the depth of water affects its color and value, how to depict still and moving water, techniques and color palettes for water and using water features in your compositions. This class starts June 12th. Join us!